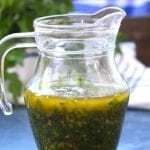 A fresh and flavorful sauce for veggies, steaks, seafood, chicken,etc. The possibilities are endless. Option 1 Prepration - Whisk together oil, lemon juice, vinegar, garlic, chili pepper flakes, oregano, sea salt and ground pepper. Dice herbs and stir into vinaigrette. Option 2 Preparation - Place all ingredients in a food processor and pulse until chunky and incorporated (not pureed). Adapted from Chowhound.com. If doing the elimination diet and citrus is not allowed, substitute with vinegar.